NetApp’s StorageGRID object store is very easy to use, but it can be challenging to get all of the right infrastructure together to deploy it, especially if you just want to try it out. But under the covers it’s built and deployed as container images, and recent Kubernetes-friendly enhancements make it possible to use those to deploy StorageGRID in an existing Kubernetes cluster, making it easy to try as well! Note: This deployment method is not officially supported. In this post, we will extract the Docker images from the Ubuntu/Debian bare metal distribution packages, make the images available to our Kubernetes worker nodes and deploy StorageGRID onto our Kubernetes cluster. Our example shows a minimal, single site StorageGRID deployment with one primary Admin Node and three Storage Nodes. Kubernetes pods within the same cluster can communicate directly with each other; this is perfect for a single StorageGRID site as all the StorageGRID nodes need to intercommunicate. Additionally, the three Storage Nodes will register with the Admin Node by providing the Admin Node’s DNS name during deployment. A Kubernetes headless service will provide DNS mappings for the StorageGRID nodes. Using the DNS name, as opposed to the IP, will also allow the Storage Nodes to be deployed in parallel with the Admin Node. Note: The existence of multiple sites would require StorageGRID nodes at each site be able to route directly to StorageGRID nodes at the other sites. This could be accomplished with a VPN or other tunneling technology and is outside the scope of this blog. A primary Admin Node is required for every StorageGRID deployment (secondary Admin Nodes are optional). Admin Nodes provide the Grid Manager Interface (GMI) for administering your StorageGRID deployment using a web browser. Archive Nodes are optional. Archive Nodes act as an agent to a Tivoli Storage Manager (TSM) or Amazon S3 account for indefinite storage. The API Gateway Node monitors the health of the grid and the usage of each Storage Node. Since this is a minimalistic deployment, we will forego the Gateway Node’s health checks and use Kubernetes basic round-robin built-in load-balancer. For further discussion on StorageGRID load balancing, see this Technical Report. Command line access to Master and Worker nodes of the cluster. Load the StorageGRID Docker images on each Kubernetes node. Note: Alternatively, the StorageGRID images could be hosted on a private Docker repository; just make sure to update the admin-node.yaml and the storage-node.yaml files with the image names. This example uses Trident; however, any Kubernetes storage class can be used. Note: Within this file, you must modify storageClassName to suit your Kubernetes system. Wait until all the PVCs are bound before continuing. The headless DNS service will allow the use of a DNS name to reference the Admin Node. Verify the StatefullSet deployed and the pod started. Verify the Admin Node is waiting for configuration (last line in this output). Note: This command only shows the last three lines. [INSG] Grid Manager has been started. Verify the StatefulSet deployed and all the pods started. Verify that each Storage Node is waiting for approval (last line in this output – only dc1-sn-0 is shown). The Admin Node service will map GMI HTTPS (port 443) from the Admin Node to make it available at port 30443 of each Kubernetes node. The Storage Node service will map S3 protocol (port 18082) from the Storage Nodes to make them available at port 32182 of each Kubernetes node (Kubernetes will manage load-balancing). Accept the default StorageGRID insecure certificate. 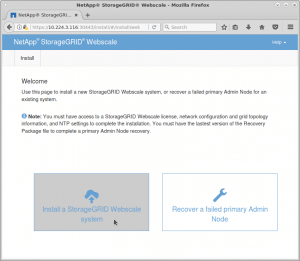 From this point forward, you can follow the StorageGRID 11.2.0 installation documentation. Step 3: Grid Nodes – Make sure all four StorageGRID nodes get approved. Note: NTP, DNS, and other fields will be specific to your environment, fill them in accordingly. Click the Install button and monitor the installation. Log in as the administrator (use the password created during installation). Add Tenants and Buckets (making note of AWS_SECRET_ACCESS_KEY and AWS_ACCESS_KEY_ID). Don’t forget to direct your S3 client to port 32182 of the EXTERNAL-IP of the service. At this point you have a fully functional StorageGRID system; albeit very minimum isolated single site grid. You can now leverage information lifecycle management (ILM) rules to manage object data. Kubernetes and its deployment model have greatly simplified this whole process. We’re specifying compute resources, storage resources, DNS names, services to expose, etc.. Also, we’re deploying all the pods as StatefulSets, this makes all the PVCs stick their pods. The six yaml files mentioned in this post can be found on GitHub. In addition, there are three more files enabling you to deploy an Archive Node (archive-node.yaml) and a Gateway Node (gateway-node.yaml, gateway-service.yaml). StorageGRID platform developer at NetApp Inc.